Hickson 57 in Leo is better known as "Copeland's Septet" and was discovered on February 9, 1874 by Ralph Copeland, an assistant on Lord Rosse's 72-inch. 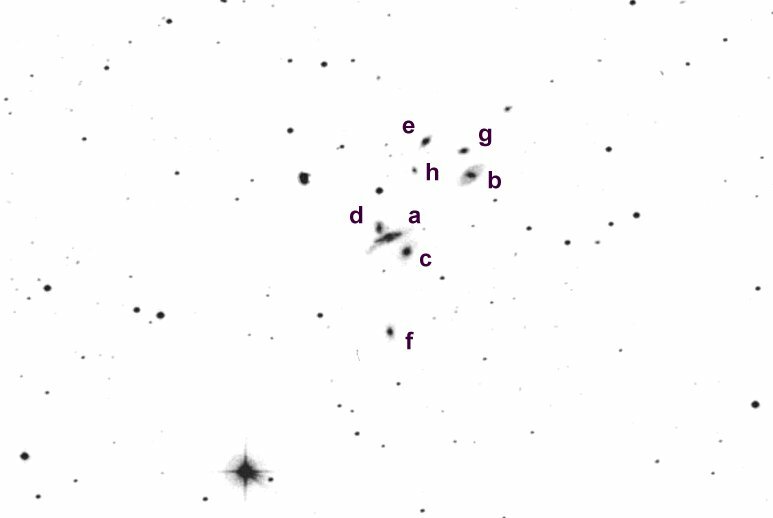 This challenging group consists of 7 NGC galaxies (3745, 3746, 3748, 3750, 3751, 3753, 3754) contained within a 5' circle and requires a 10"-12.5" scope for a decent view. Unfortunately, Copeland confused the field with a nearby area containing two faint galaxies (NGC 3743 and 3758) and reduced the positions using the wrong reference stars. In compiling the NGC in 1888, Dreyer used these incorrect positions and this later resulted in the RNGC classifying the entire group as nonexistent! More recent catalogues and atlases list Copeland's Septet at the correct position. NGC 3753 is the brightest member of Hickson #57 at 13.6V. In my 17.5-inch I logged it as "faint, fairly small, elongated 5:2 WNW-ESE, containing a bright core." NGC 3750 is a faint companion (13.9V) just 0.7' southwest that simply appears as a very small, round knot. Even dimmer is NGC 3754 situated just off the northeast end of NGC 3753. A second close trio is located about 3' northwest. The brightest of these three, NGC 3746, glows dimly at 14.2V and although photographs reveal a barred spiral, I only noted a very small, round, featureless spot. Two faint glimmers, NGC 3745 and NGC 3748, were barely visible 1' north and 2' northeast, respectively. Finally, less than 3' south of NGC 3753 is NGC 3751, comparable in difficulty to the two companions of NGC 3746.